hahahaha @ that pic of Tyler. 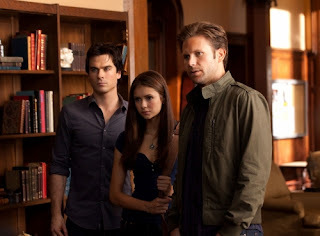 I knew Alaric was coming back! and it looks like he might be sticking around too since him & Elana's aunt are finally getting it on. And yes Jes, I believe what you said about Katherine's past & what they discovered at the college is correct. I have NO clue what Katherine's intentions are. I don't believe that she's just there to get Stefan back. There has to be more to it. And I don't think we'll see a resolve for awhile.. because after all.. isn't the show pretty much based around this?? 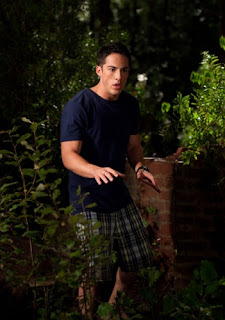 Umm how sad was that at the end when Caroline made Matt break up with her??!! Arghhhh! I love her as a vamp. I love these recaps, good job Jes! Caroline is a most awesome female vamp. LOVE her! I do hope she doesn't turn into Katherine's toy though and becomes a toy for her. I love the dialog with Stefan & Caroline.. too funny! The whole wolf scene had me on edge. I'm not sure I was breathing the last 15 minutes! Whatever Kathryn is up to.. it's no good but I have no clue as to what it is!